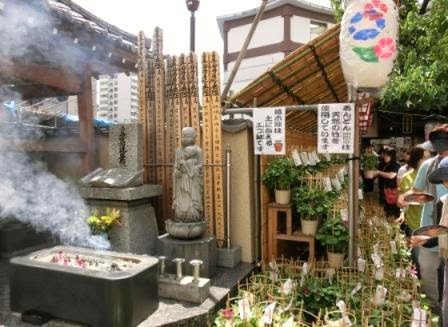 Iriya Asagao (Morning Glory) Festival/Market/Matsuri is held on 6, 7 and 8 July every year. 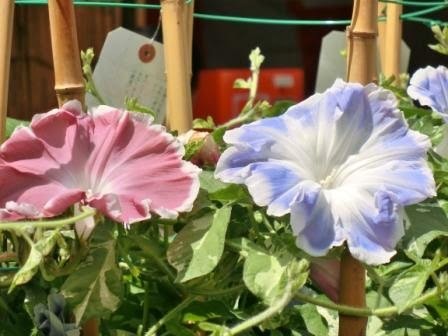 Morning glory is an icon of Japanese summer and this festival has been popular for more than 100 years. 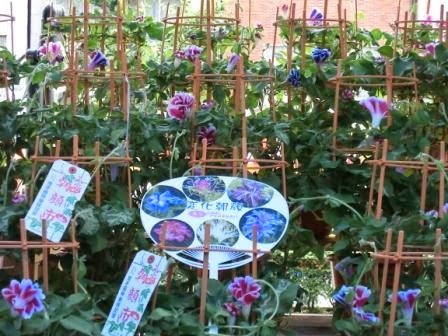 Today, most 6 year-old kids grow morning glories in science classes at elementary school. If you are visiting Tokyo on these dates, it’s a good idea to explore it to feel summer in Japan. The schedule, how to get there and Google maps are at the bottom of this post. Just explore traditional Tokyo first! 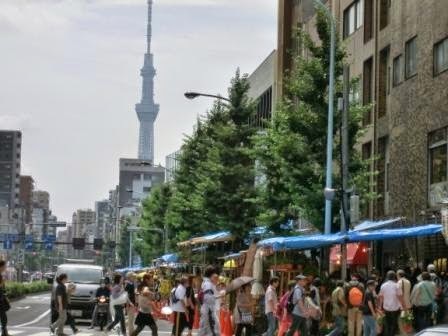 Iriya is a district near Ueno and Asakusa, so Tokyo Skytree is seen well. All the blue sheet roofs are all morning glory sellers. Like this, there are so many of Asagao pots. Many sellers are wearing casual kimonos of asagao designs. Beautiful, aren’t they? There are many kind of morning glories. Colors, sizes, lines, etc. Which is your favorite? One pot for 2000 yen, generally. (cf: estimates of exchange rate) So, around $20. Travel Tip: The dull red color on the left is called “Danjuro,” which is rare. I see them only at this market. It was so crowded… The narrow path for walkers are jam-packed. But it’s an old story now because the festival organizers started pedestrian streets some years ago! They know Tokyo has changed from that of 100 years ago, so they close the broad street for walkers. Wow! 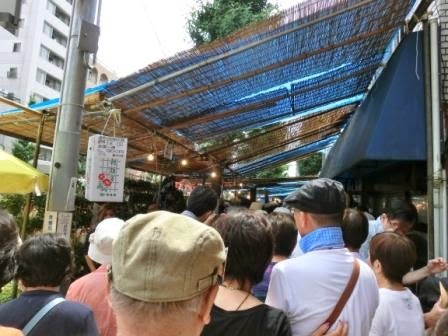 I write what time it’s a pedestrian street on Event Information of Tokyo Direct Guide, so check it out and go there on a good time! Across from the market, there are a lot of food and toy booths lined along the street. 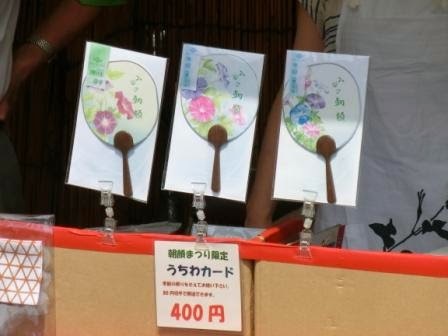 You’ll feet the atmosphere of Japanese local festivals. This is the small temple of Iriya Kishimojin. Full of morning glories on the day. Want to ship an Asagao pot? You might be thinking of buying a pot and sending it back home. Is it possible? 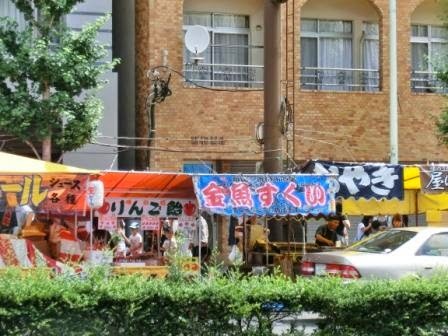 Inside Japan, transportation companies come next to the sellers. 900 yen to anywhere in Japan. How about sending it internationally? Is it possible? I called Japan Post to ask about this. 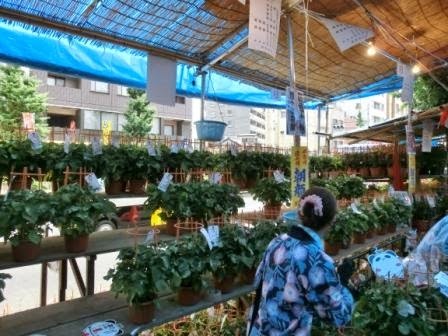 According to Japan Post, the postal service can deal with sending some plants, but it is the matter of the kind of the plant, Plant Protection Station of the government and the country you send to. If you fulfill the requirements and pass the inspection, you can send a plant through EMS or other international postal services. So, it is the fastest way to ask a Plant Protection Station. If you think of bringing it on the plane, ask the airlines. When you send a plant pot at last, don’t forget giving enough water, making sure of not spilling the soil and holding it in the box. I suppose many of you want some great souvenirs which are easy to get and take. I advise you to get something! Available only at Asagao Market! You’ll proudly show it as rare souvenirs. Beautiful and very Japanese. You can get it inside Kishimojin Temple. 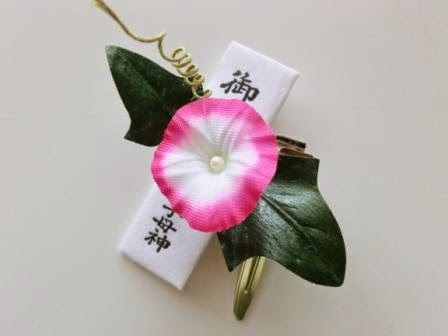 A charm of Kishimojin Temple. A clip is on the back. People at the temple gave it a short sutra when you buy it. The Large one is 900 yen. They flourish forever! Wish your day at Asagao Market will be cool! How to Get There: JR Uguisu-dani, which is next to Ueno, is the nearest. Yamanote Line and Keihin-tohoku Line. 5 minutes walk. Iriya Station of Hibiya Subway Line is all right as well. You can walk from Ueno, but it is a bit far.